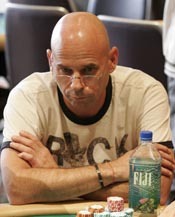 Patatino or Guy Laliberte is a regular high stakes poker player that plays mostly on Full Tilt Poker. Patatino is widely known for his reckless and often fearless style. Guy Laliberte isn’t afraid to play the best players in the world heads-up or shorthanded. This includes players like Phil Ivey, Patrik Anthonius and OMGCLAYAIKEN. His results have been very mixed online. Although he won the biggest pot in the history of online poker, he is a losing player overall. As of this writing his losses are in the millions on Full Tilt Poker alone according to high stakes db. Biggest pot in online poker, Patatino ! Patatino received the honor of winning the largest post in online poker history on Full Tilt Poker. The poor player on the receiving end was Trex 313 and the pot was worth 609 730 dollars ! See below for a transcript of this sick hand. Other than this honor he has had rather mixed results at the online poker rooms. Patatino is Guy Laliberte. Guy Laliberté is the founder and chief executive officer of Cirque du Soleil. He was born in Quebec in Canada and surprisingly started out his career as an accordion player. He is now a billionaire and has plenty of spare change to play high stakes poker! In 2006, he was named the Ernst & Young Entrepreneur of the Year. It is rumoured he holds a 95% share holder of the 1.2 billion dollar Cirque Du Soleil. Guy is a “self made man” which makes his story even more incredible. Watch below for Patatino’s poker interview (brought to you by Pokerwire). Enjoy ! So you may be wondering just how big Patatino’s bankroll is online. Well it certainy is bigger than yours ! The truth is there is no way to know. But keep in mind that most pros don’t keep a lot of money in their online accounts. If you think about Guy’s net worth, you can easily say that his online bankroll is bottomless ! Patatino, what are you goals in poker ? Well, we can tell you one thing, this guy loves poker and he wants to make it to the top no matter what. Sure he is having a rocky start, but who starts off playing Phil Ivey at the Railheaven Table with 500/1K blinds ? Yes, no one. There is no doubt that Patatino is acquiring an incredible amount of experience playing the best players in the world. Is Patatino going to be the next online poker phenom ? I know a lot of you would bet against this, but think about it: If you had a bottomless bankroll and could play the best players in the world whenever you feeled like it, your skill would go up exponentionally. Anyways, we wish Patatino the Best in his poker career ! This entry was posted on Sunday, October 5th, 2008 at 12:45 am	and is filed under California Poker. You can follow any responses to this entry through the RSS 2.0 feed. You can leave a response, or trackback from your own site.